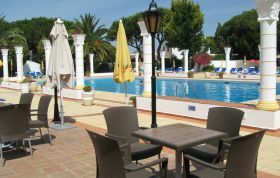 Dunas Douradas, (meaning ‘Golden Dunes’) is a resort of holiday villas and apartments, well located by the sea between the renowned resorts of Vale do Lobo and Quinta do Lago. Part of this so-called 'golden triangle' of resorts, Dunas Douradas is situated a convenient 20 minute drive from Faro International Airport. Nearby is the small town of Almancil with its shops, supermarkets and cafes, whilst the larger town of Loule, with its traditional market, and Vilamoura, with its marina, shopping, boat tours and nightlife, are both within 10 minutes drive. Set in acres of pine woods on the edge of the dunes, the dunas douradas holiday villas and apartments have been designed to resemble a village surrounding the centre-piece of the resort which is the superb huge Roman style swimming pool and children's pool, as well as the dunas douradas 24 hour reception. The holiday apartments and village houses are surrounded by larger holiday villas with private pools. 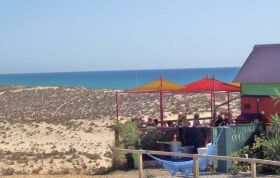 A lovely long sandy beach, with some popular cafes and restaurants, is between 5 and 15 minutes walk away, depending on the property location. 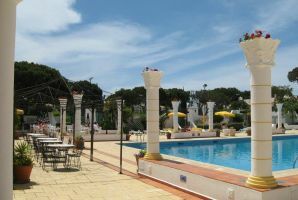 The superb large 'Roman style' communal pool is the centre-piece of the Dunas Douradas resort, by the reception and restaurant. The children's pool is adjacent. 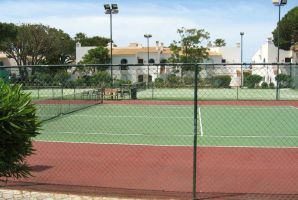 Tennis courts with weekly tennis programmes, coaching and game arranging for all ages and standards. Small local charge for court hire for clients staying at Dunas Douradas. Details from Dunas reception. Beach bars and restaurants within walking distance. A long sandy beach is available within walking distance, and Dunas has its own beach concession with sun-loungers and beach parasols (extra charge).